A nursing home may not be your first choice, but it may the best choice you have when it comes to providing Dad with the most appropriate care. Ask Dad’s doctor what type of care he’ll need. All nursing homes do not provide the same assistance or quality of life to residents. 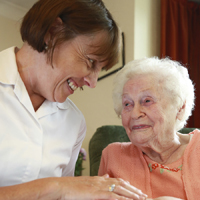 Make appointments with Admissions Directors at three to five nursing homes. Discuss Dad’s requirements, including religious needs special diets, therapies, memory care. Be honest about your parent’s finances. Obtain a full list of add-on charges. Get help reading the contract before signing. How do you feel when you walk into the building? Does the nursing home look and smell clean? Do the surroundings make you feel uncomfortable or depressed? Do the residents appear clean, comfortable, and content? Does the staff know their names and talk to them kindly, respectfully? How many staff are full time? Per Diem? How long has the staff worked there? Does the nursing home have visiting PCPs, psychiatrists, dentists, podiatrists? Can you make Dad’s room comfortable and homey with his possessions? What kind of quality of life will Dad have in the nursing home? Investigate protocols for snacks, assistance with feeding, outings, check monthly calendar for activities, outings. Is the location convenient for you? Consider the travelling time you will spend visiting your parent. Revisit your top choices with a friend, colleague, family member or professional advisor. It’s always wise to obtain a second opinion before making life-altering decisions. Be honest with yourself; try to understand that you’ve made every effort to make the best decision. Once you have selected a community, give yourself and Dad at least four to six weeks to adjust to the new environment. During that time, get to know the staff and help them understand Dad’s needs and wants—and yours. Make Sure Loved Ones Get What They Pay For!